Use the Fire Retardant Wood Sources Guide to find the Western treaters close to your location who offer quality fire retardant wood products. These suppliers also are listed in the Sources Guide publication to assist in finding the quality fire retardant wood products available from the top treaters in the West. While wood offers many beneficial features, it also burns when exposed to fire. Fortunately, for some uses the wood can be treated to protect against fire. The FireResistantWood.org website offers extensive information about how pressure treating can protect wood against fire. 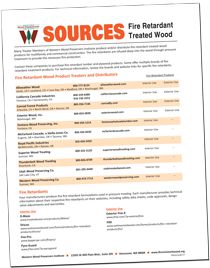 The Sources section lists Western treaters that make FR wood products, with sales contact information and links to their respective websites. Visitors also can download publications from an Online Technical Library, which also includes links to a variety of publications and product support materials available from fire-retardant treatment manufacturers.